Judy Blume will be speaking at the University of Hartford on June 21st as a fundraiser for The Mark Twain House & Museum. I’ll be interviewing her onstage and taking tons of audience questions. In preparation, I will be reading her complete works and blogging about the experience. Get your tickets here. More Fudge! So much Fudge! My teeth are aching from the sweetness and hilarity. 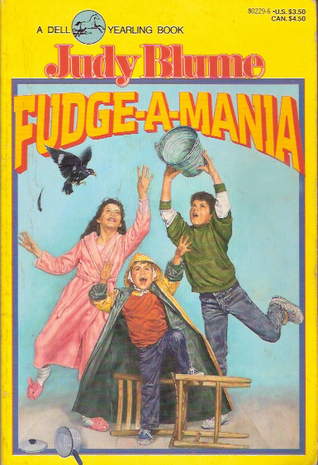 All of the Fudge books were written years and years apart. It had been seven years since Blume's last when she finally succumbed to a new novel about the Hatchers and their neighbor Sheila going on vacation together in Maine. As it happens, Maine is my family's vacation destination, too. Oh, Judy, growing up in New Jersey and going to all of my favorite places! Thank you for writing about my very life. This book is just fun. Oil of ole, a grandparents' romance, baseball games, and other shenanigans. It's a little chaotic with all of these great characters-- Peter, Fudge, baby Tootsie, their parents, Sheila, her sister Libby, their parents, the grandparents, dogs, and a baseball star-- but I think that's a good thing. "You're all maniacs!" Libby shouted. Either Libby didn't get my joke or she decided to ignore it. Because she said, "This is all your fault, Peter! Chaos follows you and your family." "Chaos," I said. "I don't believe I know him." So, for a really book-report-y ending to this blog post: if you like overcrowded summer cabins with too many overjoyed people and lots of shouting (which I adore), you will like this book. It seems to linger longer than its 146 big-print pages. It's a long weekend just for fun. We all need one of those once in a while.